Part of the £15million ‘Weston Package’ Scheme has now finished at Worle Parkway Train station. 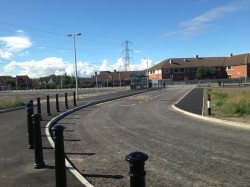 A new car park has been created just off Diamond Batch which links Weston Gateway Business Park to Worle Parkway. Works to improve parking and transport links out of the train station were swiftly undertaken and sees an additional 300 car parking spaces as well as a dedicated bus stop with shelters forming part of Worle Park and Ride. Department for Transport and North Somerset Council funded the improvement works making it easier for commuters to get in and out of Weston. The new Worle park and ride has a direct entrance to the platform of Worle Parkway Train Station and provides regular services all over North Somerset from Bristol, Exeter and London. Weston Gateway Business Park has seen an increased level of enquiries over the last quarter and with this additional benefit Dowlas hope to continue their success.